HER mum ran a successful coffee shop at the site she took over six months ago, so Kristy O'Brien had an inkling her deli cafe would go well. 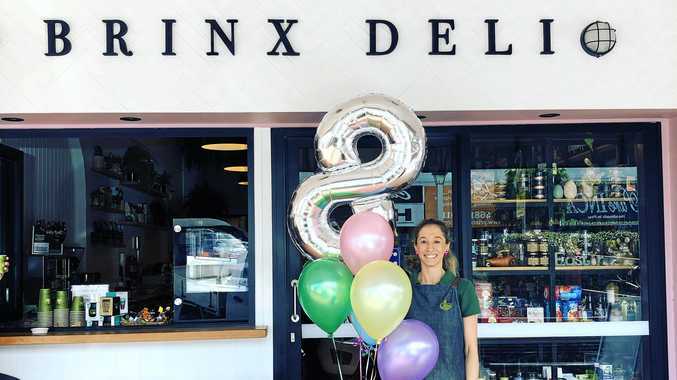 This week Brinx Deli and Cafe celebrates six months at its new premises on Maryland St, and eight years as a business. Ms O'Brien's said her mum Rita ran The Coffee Spot in the same shop when she was in high school, and she remembers when the council did a footpath extension to enable al fresco dining. "I knew how happy she used to be,” Ms O'Brien said. Working in her mum's old shop, albeit with a major refit, is "a bit like deja vu,” she said. She often jokes with her mum that she should have just taken over when The Coffee Spot closed in 2005. But she didn't open Brinx until 2011. To celebrate the business' eighth birthday she was planning a fun trip for her staff, possibly to a theme park, she said. Asked what lessons she has learned as a business owner, she said she has a thicker skin now than when she was 24 years old and first got involved. Now she took it with a grain of salt, she said. "You can be the ripest, juiciest peach on the whole wide world but there's still going to be someone who hates peaches,” she said. She said repeat customers from Brisbane had been in touch when the shop closed for three months to renovate its new premises, shocked and panicking because they thought Brinx was closed for good. It was "it's nice to know people like my shop and what I'm doing,” she said.